For more than forty years, Charles Lloyd has been the small combo leader making distinctively impressionistic and soulful kind of small combo jazz. His tenor's delicate, almost alto-like timbre is instantly recognizable from just a single note. His prolific periods of the late sixties and since the late eighties have produced consistently strong albums. Many stars have played in Lloyd's band, and in many cases, gotten their major career boosts playing behind him. Jack deJohnette, Cecil, McBee, Keith Jarrett and Michael Pettruciani all gigged in his group. And yet, Lloyd is oddly not often considered when the subject of major living figures in jazz comes up. 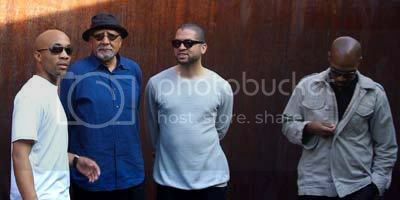 Charles Lloyd is the jazz legend who is hidden in plain sight. There have been nearly an album a year from Lloyd since he came of of semi-retirement and signed with ECM Records about twenty years ago. It could be a daunting task just to decide where to start with his discography with that label since they're all serious efforts. When his latest Rabo de Nube was issued this past March, I was tempted to forgo writing about it, just because as good as I knew it was going to be, it's still "just another Charles Lloyd" album. That is, until I actually listened to it. Click here for more at somethingelsereviews.com.